This past weekend (Oct 26-27, 2018) we held our first ever National Gathering for the Gravity Leadership Community. 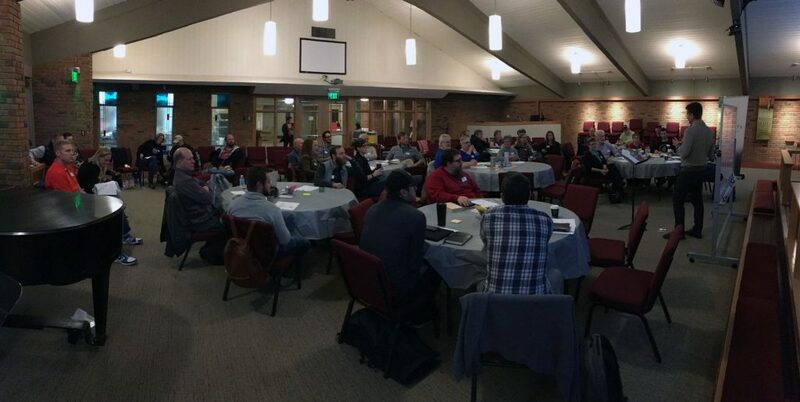 We hosted 50 people or so in a day and a half of teaching, discussion, collaboration, and prayer on the themes of shaping communities for mission in our frenetic world. We’ll talk more about what we noticed and learned during the gathering on an upcoming podcast, but I wanted to write down a few reflections from the gathering while it’s still fresh in my mind. Not just knowing that there are others like you, but seeing and touching and talking to them is deeply encouraging. It’s a healing thought to know that you’re not crazy (well, maybe you are crazy, but at least we’re all crazy together). Even without any teaching, my hunch is that, for many of us, it would have been enough to simply be together with others God is leading in a similar direction, because trying to shift paradigms can be lonely, frustrating work. It’s good to know there are others on the same journey. My second reflection is that the learning really is in the room. I have to admit I was slightly nervous about the way we structured the gathering. We scheduled lots of time for generative discussion, which means that if people didn’t bring their own questions, observations, and reflections with them, we were going to be in for a loooooong day and a half. But I was pleased to see how quickly everyone dove into the spirit of the gathering. I think everyone helped create an environment where we could all discover something new and see from a new perspective. We still have a lot to learn about creating a “learning commons” environment, but I was so encouraged to see what happened in the room. There’s so much wisdom embedded in leaders who are practicing this stuff every day. Finally, I don’t know how else to put this, but God seems to be up to something in our midst! More than just a good time of collaborative learning, it seemed to me that this gathering was the start of a new season or something. We’ve been coaching, training, and consulting leaders for several years now, but what I sensed was that God was drawing together a network of leaders who’ve been on this journey together and want to stay in it for the long haul. A group of spiritual friends that can walk alongside each other and encourage each other. I’m not sure I can identify it any more concretely than that, but it’s deeply encouraging to me to see what God did in our midst this past weekend, and I’m eager to see what God do in the future as we convene more of these kinds of gatherings around the country in the year to come! I hope to see many of you at future gatherings!